Organized by Orient Foundation and Art For All Society (AFA), the annual event sponsored by ICM, “Autumn Salon” will be held at Casa Garden in this early November. Up to now it has been eight years since the first Autumn Salon that held in 2010. The “Autumn Salon” last year had exhibited 58 artworks by 30 Macau local artists, including oil painting, watercolor, sketching, photography, sculpture, printmaking, ceramics, installation and video arts etc. Over the past eight years, we still keep providing a platform to the Macau artists for showcasing their latest works. Through this event, we hope all the local artists, especially the young generation can have more opportunities in participation, so as to have a good starting point in their roads to art. Furthermore, in order to encourage Macau young artists keep doing art creation, Orient Foundation has launched “Orient Foundation Art Award” every year. The winner will have an opportunity to visit Portugal in 2018 for a month as artist residency (the total prize of MOP$50,000 includes air tickets and accommodation). If the participants’ artworks have awarded or selected, they will have the chance to showcase their artworks together with the selected artworks of “Autumn Salon” in Casa Garden. Participate in "Autumn Salon 2018" or "Orient Foundation Art Award"
*Please read the Regulations before applying. This is a contemporary art open call for all Macau residents and also the artists who are now living and working in Macau. Applicants can submit the work that is painting, printmaking, sculpture, photography, installation and video, etc. All submissions will be reviewed and selected by a jury composed by the representatives of Orient Foundation and AFA as well as invited local veteran artists. The finalists will be notified at the end of September. If you would like to join this great event, please download the application form at www.afamacau.com. All application materials should be submitted before August 30 by either post or email. (No need to submit the actual work at this stage). The address of AFA is: Av. Dr Redrigo Rodrigues No. 265, Macau, Art Garden, 1st Floor. For “Orient Foundation Art Award”, participants should be Macau local residents and under the age of 35. 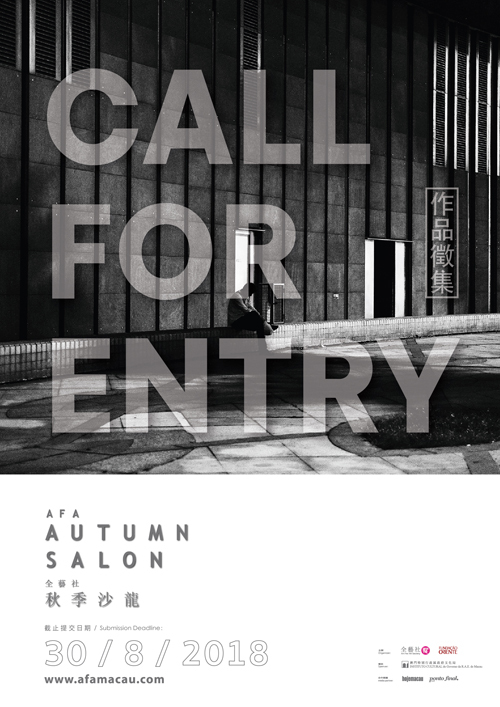 Applicants can choose to participate in both “Orient Foundation Art Award” and “Autumn Salon” in the application form of “Autumn Salon”. But please be noted that an artwork can’t be participated in both “Autumn Salon” and “Orient Foundation Art Award” at the same time. The application material should be submitted to AFA before August 30 by either post or email (the actual artwork for “Orient Foundation Art Award” should be submitted to Orient Foundation separately at the application stage), as well as the personal information of the artists, resume and the copy of Macao ID card. “Autumn Salon 2018” is partly sponsored by the Cultural Affairs Bureau of Macao SAR Government. Media partners are Hoje Macau and Ponto Final. The opening of the exhibition will be held in early November at Orient Foundation. For any enquiries please contact with us at 2836 6064 or email to info@afamacau.com.